I found this today and I know there are many GSP lovers on this forum (me included). In the contest for the best 21st-century gundog the hunt, point, retrieve breeds are separated only by a hair’s breadth – or length. There is a serious danger that we may just have lost our last excuse for having so many dogs. Up until now there has really been no answer in Britain to the argument that we need our traditional labradors for sitting on the peg and retrieving; springer spaniels to do the beating and dogging-in; pointers and setters for all grouse work; and cockers because... well, we just have to have them. But as far as Europeans are concerned this is the shooting equivalent of not inventing the wheel, and typical of our national tendency to over-man – or, rather, over-dog. Instead, the Continentals propose just one dog for all the different shooting roles and more besides, such as trailing wounded deer or just looking good lying across the baronial hearth. This so-called wunder dog is the hunter, pointer, retriever (HPR), and one breed specifically: the German shorthaired pointer (GSP). Well they are great dogs, and I agree with the article we do seem to have more things then we need, so why have a few dogs if one can do all the jobs, they are fantastic looking dogs, there are some GSPs called Diesel and Echo at our college (Diesel came after I got my Diesel) and they are from show backgrounds and do all right in that, but they are being trained to do gun work as well, I really love though dogs doing what they were bred for, and these type of dogs obviously do it well. GSP are wonderful dogs and I would love to own one as I think they would enjoy the kind of life we could give them. I wonder though about the argument that a GSP can do it all. 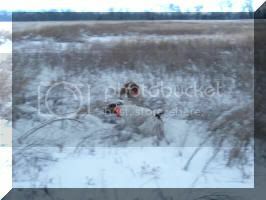 At least around here where I live, hunters continue to use retrievers to get downed ducks on ponds with very cold water. Granted those dog owners are far outnumbered by people who own Goldens and Labs as pets (I never seem to see anyone who has a Chessie as a pet) but I don't think a Pointer would be able to swim like a Retriever. It's a an excellent article, but every time I see an article like that I shudder. The last thing any GSP enthusiast wants is for the GSP to go the way of the lab due to increased popularity. As the article points out they are among the most versatile of the gun dogs, but there aren't that many potential owners that would be able or willing to put that versatility to use. 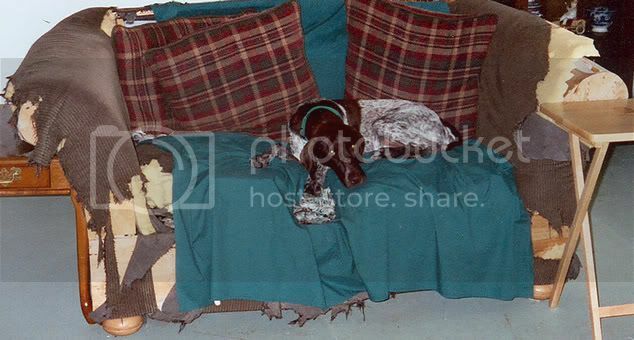 A bored GSP can be a holy terror when it comes to destruction or escaping. Oh Dear Apples! And he knows he's been bad too look at his face! As you so rightly say these dogs need exercise - and lots of it. A shorthair would fit perfectly with your lifestyle! Not all pointers are created equally. Pointers and German Shorthaired Pointers are completely different dogs. The Pointer is a specialist and was bred to hunt in open country whereas the shorthair is an all purpose dog bred to work in any terrain. The coat even though short, is dense and thick to protect them from the cold and they have webbed feet which enhances their swimming abilities. 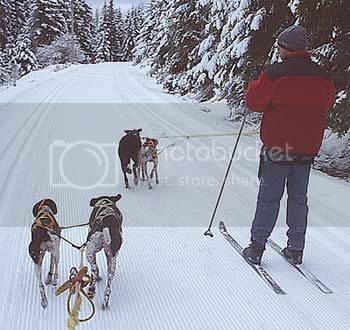 Shorthairs are becoming more and more popular as sled dogs too. Even so it stands to reason they wouldn't do as well in icy waters in the colder climates as the retrievers. But they would fare a whole lot better than a pointer. I think the Lab's are so popular because of being so docile and great pets as well as hunters, swimmers etc.? All dogs shed or drop hair, so shedders are normal to put up with in any breed, grooming a must. Just shorter haired dogs I feel are worse as the hair imbeds itself into furniture making it even harder to vacumn up as with longer haired ones. My Boxer and Boston Terrier had made our furniture another color one reason NO dogs on my couch, chairs or bed anymore.~~!!! We call those hairs shorthair splinters Pat. If you get one embedded in the bottom of your foot it hurts like the very dickens. They do shed slightly year round, but in the spring and fall, they shed just like any other dog. At those times the dead coat has to be removed with a shedding tool, similar to a hacksaw blade. I'm honored to hear you say that! All the same don't tempt me!!! And please don't tell Sophia, but Goldens and Labbies are a little too 'happy-go-lucky-I-love-the world' type for me. Left to myself I'd rather have a Chessie but hubby is very much a Labby/Golden type. Pat I think you are right about why these two breeds became popular as family dogs. Bred well, they are easy to train recall and fetch, they won't roam, they are eager to please and don't mind little kids hitting them in the face. Yes Labs shed terribly but people don't realize this because the think that because Labbies have short hair they don't shed. In fact they shed IMO far worse than Goldens. It's a terrible shame that both became so popular that everyone and his brother started breeding them. Last edited by skunkstripe; 10-30-2008 at 02:07 PM.. It's a rare shorthair that won't roam if given the opportunity. All it takes is an open gate, no supervision and they'll follow their noses! They're not bred like retrievers to remain beside the hunter or in close proximity while the birds come to them, are brought down, and they're sent for the retrieve. They're bred to work in front of the hunter at a distance, only stopping when they themselves actually find birds. Once the bird is flushed, brought down and retrieved, they're off again in search of more birds. That doesn't completely eliminate the shorthair as a hiking buddy but they are more independent and self reliant than the retrievers in general. Their easy trainability is a huge plus in such an active dog. When raised with kids, they're every bit as loving with them as the retrievers can be. I haven't had any personal experience with shorthairs and streams filled with ice floes. But I'd guess that even though shorthairs have tight water repellant coats, a retriever would be a far better candidate in those situations.